Ag Profesional always make innovation that help farmers to reduce costs, maximize yields and profits, and still be incredibly efficient in the process. Agr Profesional do research to help them make economically and environmentally wise crop management decisions. And there is perhaps no better innovation of smart farming than with the mobile app. It has become a game changer for on-the-go farmers and ag retailers, enabling them to perform critical tasks wherever and whenever they need it. From scouting fields and managing agronomic data, to flying agricultural drones and creating farm maps, there is virtually no job that a farming app can’t do. So, below are 21 newer, timeless and time-tested agricultural mobile apps that can get you started in 2019. 1. ID Weeds. Find a weed in your field you can’t identify?. The University of Missouri has updated its free ID Weeds app to be more user friendly. This agricultural mobile app contains information on more than 430 weed species common to fields, pastures, lawns, gardens and aquatic areas in Missouri and the surrounding area. The app allows users to choose from drop-down boxes to input plant characteristics including including their habitat, leaf type, flower color, root system or other characteristics and then this ag app identify the weed. Each weed contains detailed information and at least one photograph to help narrow down the choices. Users can also search by scientific or common name, or choose from an alphabetical list of all the weeds in the app. Yara ImageIT is an agriculture app designed to measure nitrogen uptake in a crop and generate a nitrogen recommendation based on photographs of the crop. The mobile app turns a farmer’s smartphone camera into a high-tech crop nutrient tester. ImageIT calculates nitrogen uptake based on leaf cover, leaf green color and estimated fraction of brown leaves. Besides showing the user how much nitrogen to apply to obtain optimal yield and crop quality, ImageIT provides quality assured fertilizer recommendations with Yara preferred product and contact information of the closest Yara office. 3. FarmLogs. A free app is available to introduce yourself to the premium farm management and prescription farming capabilities of the company’s software and advisory services. With the mobile app you can quickly map your field boundaries and glean historical and real-time info on each field, including rainfall data, soil maps, yield maps and growth stage estimates, says Shep Whitcomb, FarmLogs product marketing manager. “You can also log and share scouting notes, photos, and activities from the field and remotely monitor plant growth and crop performance,” he says. AgMobile. Developed in a collaboration between AgriCharts and Successful Farming, the farming mobile app offers an array of info, including commodity markets, news and weather. Among its many features are local cash grain quotes and charts, breaking news from Successful Farming, live market commentary and technical analysis. Most recent major update was the addition of info from Grains.com, an AgriCharts marketplace for farmers and grain buyers. 4. Cattle Market Mobile. A quick way to view local cattle auction reports organized by state, as well as USDA cattle market info. A “Useful Tools” section includes a calf calculator and a gestation calculator. Updates this year are addition of four new USDA commodity reports. 5. SoilWeb. The mobile app uses your phone’s GPS to tell you what soil type you’re standing on and enables you explore deep levels of info from USDA’s soil survey data. The app gives you just about everything you need to know about your farm’s soil, including soil type and taxonomy, land classification, hydraulic and flood ratings, organic matter, and more. PotashCorp’s eKonomics program, an online agricultural resource dedicated to helping farmers maximize their yields and profits, has released an updated version of its valuable return-on-investment (ROI) calculator. The latest calculator model incorporates spatial variability, giving farmers a more accurate reflection of expected nutrient response in production-sized agriculture. As a result, farmers are able to make more accurate nutrient application plans, maximizing the benefits of crop inputs and increasing their profitability. Ag Guardian was developed by a farmer for a farmer to save time and money. The app makes sure you are only paying for the supplies you order. Once you get your field names and acres set up, it takes less than a minute to enter an application. The app keeps up with where you purchased the supply, the price quoted, and the applicator that put it out. It even has a page that can be used to request price quotes from suppliers to assist farmers in locating the lowest price for input supplies. Ag Guardian will keep a running total of your inputs, and you can request a monthly report from your supplier listing your totals. If the app total matches the supplier total, you don't have to go through all those tickets looking for mistakes. 8. Tank Mix Calculator. The app generates a tank mix quickly and easily, according to the developers at TapLogic. Enter your acreage, tank size and carrier volume, then select chemicals from a list, or create your own. The app then shows the number of loads needed to spray your field. New additions to the app last year included an updated chemical list, now up to 14,000, as well as formatting and styling changes. This agriculture app from John Deere helps you manage your grain harvesting fleet from your field to your preferred elevators. Know where your team members are, where the nearest elevators are, and get information about wait times at those elevators. The apps allows you to create a team to let your workers know where the combine, carts, and trucks are; find and view your favorite grain elevators, including contact information and directions; view estimates of grain elevator wait times; and securely create and share your own on-farm storage locations with your team. Sirrus for iPhone and iPad helps agronomists and farmers collaborate on farming decisions by making field data accessible and easy to collect. By connecting to the agX Platform, standardized field data is available offline and can be shared with other users and applications. Sirrus now offers a premium upgrade that allows service providers to implement variable rate fertilizer application. Features include Product Labels; Safety Data Sheets; Variety Tech Sheets; Recommendation Reports; and Advanced Recommendation Editor. mAgri Solutions from MyriadMobile (Bushel) is a mobile app that can elevate your brand. For example, the developer recently partnered with The Arthur Companies on a solution that will provide its growers with aggregated information about their elevator contracts, scale tickets, prepays, cash bids, and markets. This agricultural mobile app provides real-time, actionable information to growers, and tools for elevators and growers to easily do business together. The app allows growers to monitor quotas during pre-harvest to ensure they do not go above their quota limit, and truck weights during both pre-harvest and main harvest to ensure truck fleet stays within legal road weight limits. Growers can also record items such as planting date, varieties planted, herbicide and fungicide applications, and other pertinent data. Growers can stay compliant with co-op reporting requirements by putting information in the mobile app, while in the field. 13. AgriSync | AgriSync Inc.
AgriSync enables farmers and advisors to connect and resolve support issues on the farm. Farmers can connect with multiple advisors from different companies to submit and receive support in real-time via video. Advisors can manage multiple service tickets through a dashboard and remote video that allows them to see what the farmer sees in real-time. A Web-based customer service dashboard allows the advisor's organization to see open cases, resolution status and farmer feedback in real-time. Pocket Rain Gauge from Agrible brings accurate, location-specific rainfall measurements delivered instantly. Log in with your free Morning Farm Report account to get rainfall totals for all of the fields tied to your account. The ag app includes feedback functionality so you can let Agrible know how accurate its measurements are. Pocket Rain Gauge data is updated every hour and reflects the previous 24 hours. The app works in the lower 48 U.S. states. 15. Canopeo. Oklahoma State University’s developers tout the ag app as a “rapid and accurate green canopy cover measurement tool.” It quantifies the percentage of canopy cover of live green vegetation for your crops and pastures, helping you monitor crop progress and make informed management decisions. New features added last fall include an option to upload images when wifi is available, as well as a screen that shows the geographic location of the images in your account. AgVault 2.0 Mobile from Sentera allows users to easily fly entire fields using a DJI Phantom 4, Phantom 3, or Inspire agricultural drone. The ag app allows the operator to select the UAV’s altitude, sensor configuration, overlap, sideslip, and an area on their field to survey. The UAV launches from within the app, autonomously flies the predetermined route and automatically returns upon completion. Praxidyn recently launched Mixmate – the portable agricultural chemical blending system. Along with this introduction, the company plans to release the Mixmate Android app for agriculture. The app can be set up ahead of time with prescriptions and jobs. The app performs the calculations according to the prescription. When the operator is ready to mix, simply select the job and confirm the batch size and settings. The app is optimized to make it fast and easy. Accurate work records are generated during the mixing process. Reporting can be done from the Android device. This is useful for inventory tracking or reporting in operations with individual users, multiple users or large multi-location operations. Your data is securely backed up to the cloud, and updates are automatic for both the app and the electronics in Mixmate. This new app from The Ohio State University allows growers to compare the effectiveness of different management decisions within fields. Called Ohio State PLOTS, the free app enables growers, as well as consultants and others who support growers, to design replicated plot layouts by creating on-farm trials that can compare hybrids, seeding populations, fertilizer rates and nutrient management systems, among other practices and inputs. The mobile app allows users to digitally compare various treatments within their fields to determine the best management plan for their fields, before extending financial or labor resources. The ag app was designed as a tool to help improve water quality in Ohio by allowing users to fine-tune nutrient management more accurately and reliably for a farm operation and by encouraging on-farm studies. Descartes Labs provides weekly yield forecasts for states and counties in the U.S. via its Descartes Crop app. While USDA NASS provides monthly forecasts at the national level and for select states, with Descartes Labs, you can see your county’s end of year yield, now. Add additional states and counties to see their forecasted yield as well. Plus, you can see the community’s opinion and share your own thoughts through polls and comments. Forecasts are updated weekly and push notifications keep you up-to-date. AGSentry from HD Precision Analytics is a Software-as-a-Service (SaaS) platform that offers simple data service and an actionable analytics tool. It focuses on seed sales tracking and opportunity in a convenient mobile platform. AGSentry increases tracking efficiencies for multiple brands; equips field management with easy to understand dashboard and performance indicators; and aligns sales and marketing with shared goals and metrics. It also improves data governance; curates and integrates sales data across multiple brands; and establishes pace to meet goals and monitor progress. Customization is also available. All are free and available in Google Play for Android and Apple’s App Store. Some include premium versions or in-app purchases. 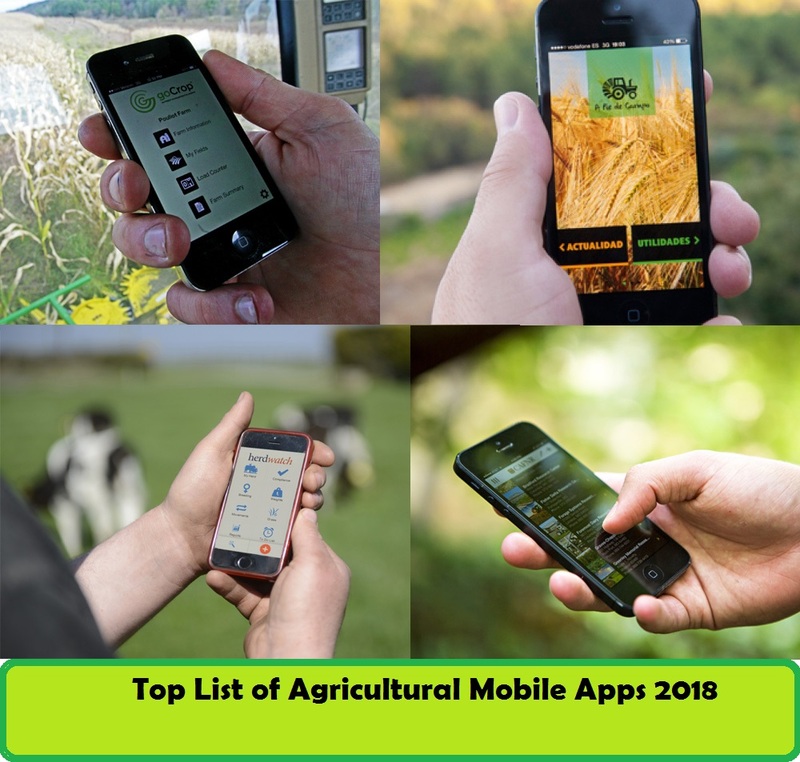 0 Response to "Top 21 List of Agriculture Mobile Apps for 2019"